In my research on the history of American immigration policy up to the watershed year of 1965, one thing that stood out was that the Jewish approach was that policy should not be tailored to meet the needs of the U.S. but to conform to the loftiest of moral principles—altruism by any other name. The testimony of Simon H. Rifkind, who represented a very broad range of Jewish organizations in the hearings on the McCarran-Walter bill in 1951, says it all. We conceive of Americanism as the spirit behind the welcome that America has traditionally extended to people of different races, all religions, all nationalities. [This is an amazing statement given that the 1924 law restricting immigration and basically excluding Asians and favoring Northwest Europe was still in force.] Americanism is a tolerant way of life that was devised by men who differed from one another vastly in religion, race background, education, and lineage, and who agreed to forget all these things and ask of a new neighbor not where he comes from but only what he can do and what is his spirit toward his fellow men. 2. The total number of immigrants should be maximized within very broad economic and political constraints: “The regulation [of immigration] is the regulation of an asset, not of a liability.” Rifkind emphasized several times that unused quotas had the effect of restricting total numbers of immigrants, and he viewed this very negatively. Looking at [selective immigration] from the point of view of the United States, never from the point of view of the immigrant, I say that we should, to some extent, allow for our temporary needs, but not to make our immigration problem an employment instrumentality. I do not think that we are buying economic commodities when we allow immigrants to come in. We are admitting human beings who will found families and raise children, whose children may reach the heights—at least so we hope and pray. For a small segment of the immigrant stream I think we are entitled to say, if we happen to be short of a particular talent, “Let us go out and look for them,” if necessary, but let us not make that the all-pervading thought. 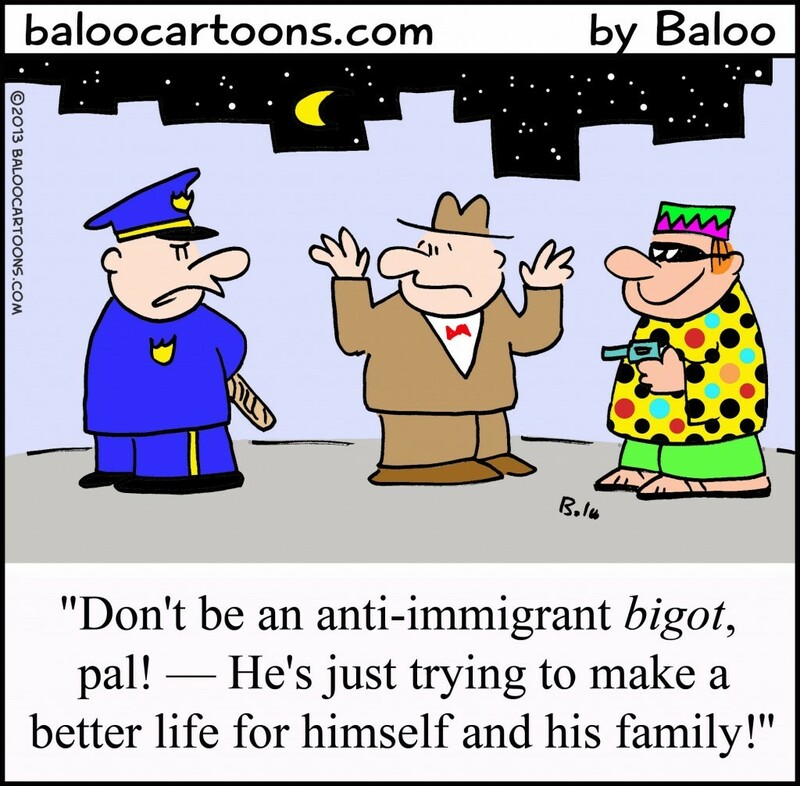 Looking at immigration from the point of view of the immigrant is, of course, an invitation for altruism. Considering the poverty of so much of the world and the lucrative benefits available to immigrants (see below), taking the view of the immigrant means dramatically ramping up immigration at a cost to the White majority. Thus it’s no surprise that Jewish organizations favor what VDARE labels the “Amnesty/Immigration Acceleration Bill” now being considered in the Senate. (On the other hand, Israel’s immigration policy is a model for favoring ethnic/national interests.) This bill has all the components desired by Jewish organizations in 1951 and continuing to the present. As always, support for displacement-level immigration and lack of concern for traditional American culture spans the entire Jewish political spectrum, from the far left to the neoconservative right. At the editorial page, the plan was repugnant because it failed to serve the highest value: inclusiveness for the world’s poor and unskilled. In other words, the point is to make sure that guest workers can become citizens. Whereas a rational guest worker program would repatriate workers when they are no longer needed, the Times wants the workers to become citizens. The only logic for this is the desire to inundate the U.S. with uneducated, low-skilled, non-White citizens. This bears emphasis. A rational immigration program aimed at alleviating labor shortages would issue guest permits for a certain period—the practice, for example, of Israel. (In fact, there is no labor shortage in the U.S.; see below.) When the term is up, the worker goes home with his family. This was the practice when I was growing up in Wisconsin: Migrant workers from Mexico would harvest crops and then go back to Mexico; there was no possibility of them becoming citizens. Allowing workers to become citizens is not an interest of business and certainly not in the interest of any society that wants to maintain a national identity or the dominance of its founding racial/ethnic group. It is certainly not in the interests of taxpayers (and businesses and businessmen are taxpayers) given the costs of importing millions of uneducated workers in terms of welfare use, etc. (see below). This is ethnic hardball pure and simple. American immigration policy since 1965 has been a war on the traditional White majority—a war that is on the verge of being won. Singer favors a bill that satisfies all three of the Jewish criteria for immigration policy. First, it goes without saying that the bill is not tailored to the interests of White America in retaining a White majority; the vast majority of immigrants will be non-White. Second, the bill will result in a huge increase in the total numbers of immigrants. As reported in The Daily Caller, it would probably bring in around 40 million new American citizens within the next 10 years—around 4 times the rate of present rate of legal immigration which is already disastrous. NumbersUSA’ said that its estimates of a 33 million inflow “are conservative … [because they do] not attempt to project increases in these categories that are certain to occur in future years,” once many of the new immigrants seek green cards for their overseas relatives. Also, some categories of immigrants are uncapped, and the analysis “does not attempt to project increases in these [family unification] categories that are certain to occur in future years,” it says. The pending bill allows illegal immigrants to bring their overseas spouses and children into the country, says the NumbersUSA report. If that provision is implemented, “it could more than double the [illegal immigrant inflow] number shown in the chart,” bringing the total inflow to 40 million by 2024, it said. We can safely assume that leaving family-related categories uncapped will lead to the higher estimates—forty million non-Whites in the next 10 years, with no end in sight as they continue to bring their relatives. This will significantly speed up the coming minority status of White Americans. Third, the bill is not geared to satisfy the needs of the United States as a whole. Harvard economist George Borjas has shown that the real winners of immigration are businesses who hire immigrants and the immigrants themselves, and the losers are native-born workers. (VDARE’s Ed Rubenstein has lots on this.) But helping the immigrants and certain businesses is not going to help the rest of their base, and allowing in millions of new Democrats will surely be the end of the Republicans as a national party. If Republicans couldn’t elect a president in 2012 despite a poor economy and with Whites being 72% of the electorate, imagine how much more impossible will it be in 10 years when Whites’ share of the electorate is much less and non-Whites vote overwhelmingly for Democrats as the party of more immigration and lucrative benefits like health care and welfare. Nearly every section of the Gang Amnesty bill seems to add more foreign workers to compete with unemployed and underemployed Americans. The Gang apparently believes that the way to help the 20 million Americans who can’t find a full-time job is to give out another 20-30 million lifetime work permits to foreign citizens over the next decade. This bill would further flood labor markets at the lower-skill levels where real wages have declined 10% to 22% since 1980. If the bill passes, the chances of Americans with no more than a high school education entering the middle class may disappear. But it isn’t just the low-end where Americans are threatened. The bill would make huge increases in importing higher-educated workers at a time when around half of all recent American college graduates either have no job at all or they aren’t working in a degree job. The total number of less-educated citizens (ages 18 to 65) not working in the first quarter of this year is 27.8 million, up from 24 million in the first quarter of 2007 and 22.2 million in the first quarter of 2000. These individuals are either unemployed or out of the labor market entirely. In total (for all education levels), there are 55.4 million adult citizens ages 18 to 65 currently not working, up from 44.4 million in same quarter of 2007 and 38.1 million in 2000. So they want to bring in millions of uneducated (and low-IQ) immigrants well known to be a drain on public services—from welfare to education. (Update, May 6, 2013: The Heritage Foundation provides a “conservative” estimate of a cost of $6.3 trillion over the lifetime of the illegal immigrants and that “if amnesty is enacted, the average adult unlawful immigrant would receive $592,000 more in government benefits over the course of his remaining lifetime than he would pay in taxes.) The main focus is once again on the chain migration of the uneducated and their families. Steven A. Camarota also of the CIS, testified in the Senate Judiciary committee on the huge impact that education has on the fiscal outcomes of immigrants, particularly on use of the welfare system and payment of taxes. 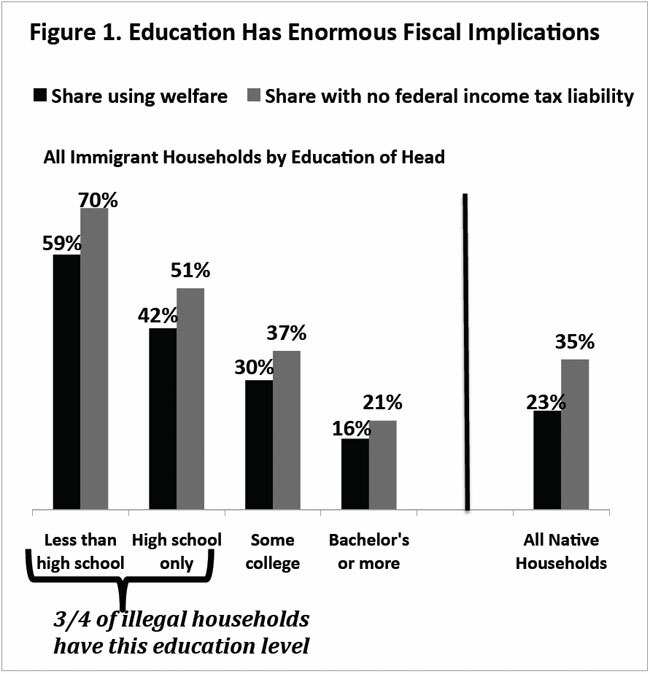 From Steven A. Camarota, “Why Less-Skilled Immigration and Amnesty Are so Costly to Taxpayers.” Source: Public-use file of the March 2011 Current Population Survey. Welfare programs include SSI, TANF, food stamps, WIC, free lunch, public/subsidized housing and Medicaid. Further, those who become naturalized will be allowed to bring in their parents who, being older, naturally have high needs for health care and immediately become eligible for Medicare and Medicaid. Finally, the staff of Sen. Jeff Sessions, leader of the patriotic forces in the Senate, has noted that amnestied immigrants will be eligible for welfare benefits from state and local governments, and that their children will be eligible to receive benefits because they are automatically citizens under the birthright citizenship. Of course, the latter phenomenon is the main reason why so many illegal immigrants are already receiving welfare benefits (see above chart). The only logic for this is altruism: White American taxpayers are being asked to provide massive benefits for people of other races and ensure that they become a political minority in the bargain. The immigration bill is a prime example of elite control, completely contrary to the attitudes and interests of White America. As expected, altruism is a tough sell, thus explaining why the MSM has basically ignored the costs embedded in the proposed bill. But despite the media blackout, most Americans and the vast majority of White Americans are clearly opposed to it. As reported in the Daily Caller article, a recent poll indicated that 55% of Americans want less immigration. Only 18 percent of Republicans and 29 percent of independents favor an increase in legal immigration—numbers that would doubtless be much lower if the Whites being polled knew what was really in the bill. (In this video, Sen. Schumer claims Americans are “overwhelmingly” in favor of comprehensive immigration reform.”) Republican elites are completely out of touch with their (overwhelmingly White) base on this issue. will be firmly centered in the Democratic Party as the party of the new permanent majority. This stridency matters because the Times represents the pinnacle of American journalism. Its editorials are followed by engaged citizens across the political spectrum … . The reason altruism is so problematic in evolutionary biology is that altruists go extinct because, in the absence of ways to make sure that selfishness doesn’t pay off (such as by expelling the selfish), they lose out to those who selfishly pursue their interests. Quite obviously, unless Whites stop their altruism, they will indeed end up as nothing more than museum specimens—much to the satisfaction of our hostile elite and its non-White allies.